Bob the bird loves to paint pictures with his best friend Bat. But one day Bat goes away and Bob is sad. He tries to paint, but everything he paints is blue! Can Bob’s friends help him to find his bright colours again...? 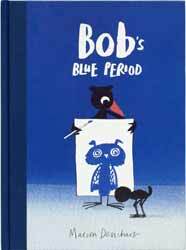 Bob’s Blue Period by Marion Deuchars, published by Laurence King, is a heart-warming picture book for children aged 3+. Deuchars's illustrations are bold and bright, and childlike in their simplicity. That's not meant as an insult, as this is exactly what will drag young minds to her work. It also has the added advantage that, should your little ones be artistic they can try to paint the characters for themselves. The story is simple and in truth, to an adult's mind, makes very little sense, but it's aimed at the very young and will aid them with reading as well as encountering the emotion that comes with missing someone. A novel, funny book that doesn't talk down to its readership.